Today’s woman constantly juggles an incredible number of responsibili-ties: jobs, children, friendships, marriages, errands, appointments – the list is endless! You’ve got to be healthy just to keep up. Women have special health concerns during every phase of their lives; pregnancy is certainly one of the most important and complex phases. Although the changes women experience from pregnancy are natural, a little extra help is sometimes needed to cope with the dramatic changes in their bodies. In addition to the noticeable changes pregnancy causes in a woman’s body, pregnancy can cause sub-tle changes in the musculoskeletal system; changes your chiropractor is able to detect and correct. Because the baby lies forward in the woman’s body during pregnancy, her center of gravity shifts and the spine alters itself to accommodate this change. 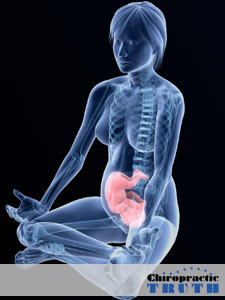 As a result, many expectant mothers may experience low back and pelvic pain. These stresses and strains can be relieved with regular chiropractic care. Many chiropractic patients re-port that their deliveries were faster and more comfortable than deliveries prior to chiropractic care. It’s especially important during pregnancy that nerve impulses flow from the brain to all parts of the body. A slightly out-of-place vertebra can create nerve irritation that snarls the body’s communication system. Using gentle spinal adjustments, the chiropractic doctor can relieve this nerve irritation, allowing the body’s energy to flow freely again and eliminate periodic pain through nature’s own healing power! Our doctor will use special, modified techniques during your pregnancy to make your spinal adjustments easy and comfortable. Isn’t it time you tried chiropractic care for you and to get ready for your future family? If you are experiencing any of the common symptoms below, please call our office now to schedule an appointment, to see how we can help.